Home > Clicgear and Rovic > LOADED! 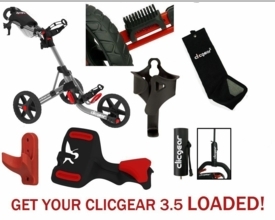 Clicgear 3.5+ Golf Push Cart Value Package Free Shipping! Our BEST VALUE! SEE ALL Clicgear Carts and Accessories! We have put together an unbeatable value package with the most popular Clicgear accessories. If ordered separately, this package would cost nearly $300, but we are offering it a LOW price of just $239! Don't settle for just the Clicgear cart, or worse overpay decking it out like you want it. Get it all here for one LOW price! You get the award winning Clicgear 3.5+ plus these GENUINE Clicgear brand accessories: Towel, Beverage Holder, Storage Hook, Shoe Brush, GPS/Phone Holder, and Umbrella Holder! "THE NEXT GENERATION IN PUSH CART TECHNOLOGY"
The Clicgear golf push cart is precisely engineered to be the world's smallest three wheel golf push cart when folded. The Clicgear folds to an amazing 24" X 15" X 13", small enough to fit into a storage locker, or corner of any vehicle trunk. That's up to 40% LESS SPACE than other three wheel carts! The Clicgear features sealed ball bearings, and maintenance free airless tires to ensure a smooth and trouble-free glide around the course. The new and improved positive locking brake system gives you complete control and confidence on any golf course terrain. The sturdy Clicgear frame utilizes oversized aircraft aluminum tubing for an unsurpassed strength to weight ratio. The Clicgear is designed for years of service, and backed by a one year warranty! Perhaps even more impressive is the Clicgear's large, on-board console loaded with a holder for your cup, scorecard, pencil, towel and glove. The Clicgear even includes and umbrella mount! Those are features that will cost you extra on the competitons carts, but are standard on the Clicgear. 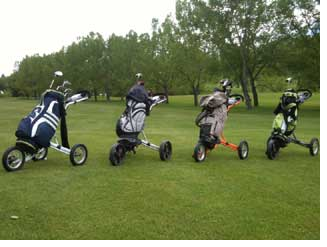 Clicgear has raised the bar for golf cart convenience, style, function, design, and quality. Find out how owning a Clicgear cart can improve your golf experience! Introductory Offer! Free Shipping to the Lower 48 United States! Latest Model 3.5+ Shipping Now! - Powder Coated Aircraft Aluminum Tubing. Lightweight and Rustproof! - Weighs only 18 Pounds! Feature for Feature and Dollar for Dollar, Nobody Has Clicgear Beat! Clicgear B3 Enhanced Golf Push Cart Bag - DESIGNED FOR Push Carts! Clicgear 3.5+ Golf Push Cart Charcoal/Black FREE ACCESSORIES! Clicgear 3.5+ Golf Push Cart Silver/Black FREE XTRA ACCESSORIES! Clicgear 3.5+ Golf Push Cart Arctic/White FREE EXTRA ACCESSORIES! Clicgear 3.5+ Golf Push Cart Charcoal/Lime FREE XTRA ACCESSORIES!